So IGN's roster reveal event came to an end last week and aside from DLC, we got the full and final roster for WWE 2K18. Or so we thought. There was one person that was curiously missing from the list and that was the boss himself, Vince McMahon, which was odd since Shane and Stephanie were confirmed and Vince has been a playable character in the game for years. 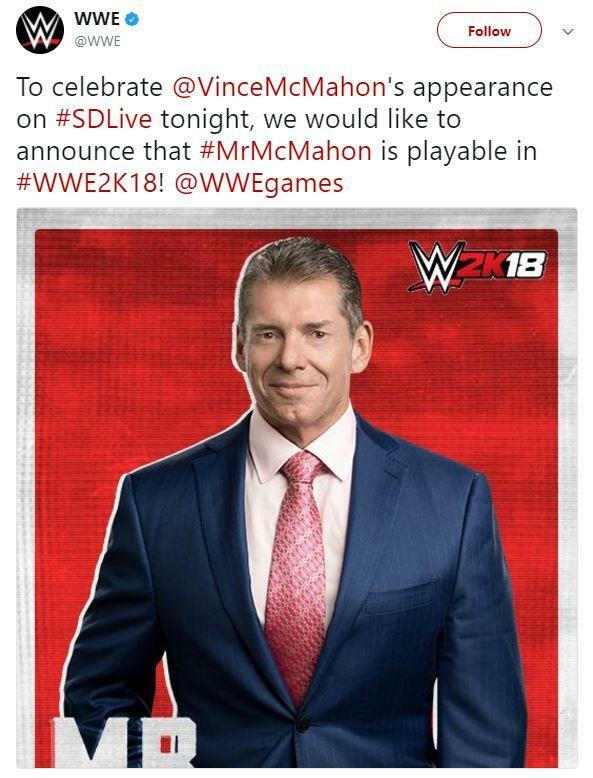 I'm not sure why they didn't confirm him during the reveal but in any case, WWE's official Twitter revealed that he will be a playable character in the game. WWE 2K18 releases on October 17th for PS4 and Xbox One, or October 13th if you buy the Deluxe Edition. No release date yet for the Nintendo Switch version.